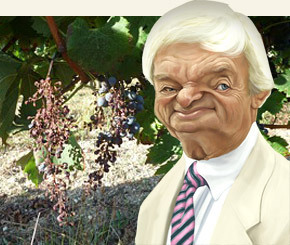 Richie Benaud OBE, the famous Australian cricketer and commentator, needs little introduction. What isn’t so well known is that he bought a vineyard in France to enjoy during his retirement. Like vines, the old ones are the best, and this audio sketch is our favourite of the last decade. Thanks to Tom G and Andrew Q for sharing it. We like it because it’s a little too close to the truth for comfort and sums up our first ten years here (“it’s votre derrière if les grapes morts”). Is this Billy Birmingham? If not and you enjoy Cricket (and Wine of course) then take a listen to this – Adults Only! It's four…. xing brillliant! I've played it quite a few times and it just gets funnier. Now sent it to my Aussie friend who's just recently returned from his official stint as 'Artist in France' and his unofficial role as 'would be tracker' of a Kangaroo, that had escaped from a zoo near Argenton- Chateau, of all places. we have all listened to it and loved every minute! I can understand his french too! Paul, yes I believe it is Billy Birmingham. Love the YouTube clip but shame about the limited revolving photos in it. I’ll immediately grab your rss feed as I can't find your email subscription link or newsletter service. Do you've any? Please let me know in order that I could subscribe. Thanks. oh, this was absolutely brilliant !! And judging from my friends in British Columbia's Okanagan Valley , very close to the truth ! Billy Birminham's stunning series of audio cds – The 12th Man – are essential listening for cricket fans. PS Richie's chateau is called Chateau Verdeflor!! As a wine enthusiast, my travels have taken me to a wide variety of vineyards and wine areas of France and Italy, and of course to the wonderful gardens of the wineries and surrounding places. Such spectacular fountains, planters and statuary! Citrus and olive trees in beautiful planters, stone statuary in the midst of bubbling fountains, elaborate terra cotta creations…. Imagine my pleasure, then, when I walked into Authentic Provence in West Palm Beach, Florida. In a beautiful environment of running water and good smells, the owners have sourced one of the finest collections of European garden antiques that I have seen in the USA: statues, fountains, planters (note especially the classic Caisse de Versailles, and Anduze pottery), terra cotta shields, stone animals, copper pots, garden spouts, etc. They also have beautiful stone fireplaces, re-purposed tiles, and many other specialty items. They are available online at http://authenticprovence.com, and can arrange shipping anywhere in the US. Well worth a visit! It's cricket season back in Oz, so time for a classic! !